"I tell you, Gil. People are desperate for guns. I can't get my hands on the hardware fast enough." On the surface, Shooters might, at first glance, seem like another Guy Ritchie wannabe. It has all of the basic components: dirty, working class neighborhood, down and out characters, large-barreled handguns, criminals with colorful names, prickly local dialogue, a narrative that occasionally jumps around a bit, and of course, the promise of a "last big score." But instead, Shooters owes more to Peter Medak's The Krays, in that the film bypasses blatant humor in favor of telling a violent and emotional crime story. Gilly (Louis Dempsey) has just been released from prison, after serving a six-year sentence, and the first thing he does is hook back up with his friend and criminal accomplice, J (Andrew Howard), to retrieve the stashed cash from their last crime, the one that he did the jail time for. The problem is that J, now knee-deep in a drug addiction of his own, has invested the cash in a risky gun and drugs operation, and the only way to get it back is for Gilly to reluctantly take part in a seemingly doomed final job that eventually pits them against Max Bell (Adrian Dunbar), a powerful and vengeful crime lord. I've seen plenty of mediocre crime flicks, and the thing that rescues a film like Shooters is the caliber of the performances. Nothing against the work by the grim Dempsey and his brooding Gilly character, but it is Andrew Howard as J—looking a lot like he could be Sting's really, really crazy son—who owns this one, and his volatile, violent, drug-addled J is the centerpiece in a film with a number of strong supporting roles. Melanie Lynskey, now part of the television series Two and a Half Men, takes the relatively small role of J's wife Marie and turns her into one of Shooters most layered characters, by nature of her questionable love and loyalty. Likewise, for a mix of dangerous laughs, Jason Hughes does a great impression of Gary-Oldman-as-Drexl-Spivey (his whacked out True Romance role), as an equally whacked out, but equally doomed criminal. Directed handily by Glenn Durfort and Colin Teague, Shooters is a low-budget flick that doesn't necessarily seem to be hampered by its apparent budget restrictions. They employ some kitschy jump cuts, and once in awhile loop the narrative back on itself, but it is the dialogue, much of it written by stars Dempsey and Howard, that resonates throughout. Characters spout bristly, macho lines with ease, and the bleak, damp and chilly locales only reinforce their compounding desperation. Image Transfer Review: Sure, Shooters is presented in 1.85:1 anamorphic widescreen, but the print itself is nothing to get excited over; it is laden with a steady stream of white specks and nicks, which compounded with the steady blocks of grain and poor black levels. Fleshtones are properly pasty, and colors have a windblown diffused chill to them that works well within the context of the story, even next to the glaring print flaws. Sadly, the quality of the print really deteriorates in the final 20 minutes or so. Audio Transfer Review: Audio comes in one flavor, and it happens to be 2.0 Dolby stereo, and it is not a particularly memorable transfer at that. Voices seem remarkably flat, and do clip a bit during loud shouting scenes (of which there are many), and only when Louis Dempsey is narrating does the track offer any significant clarity and resonance. With the accents, the dialogue is tough to understand at times, and on more than one occasion I had to resort to the subtitles to decipher the action. Gunshots don't have the wall-rattling thump that could have really helped sell a gritty little crime saga like this. Too bad. 3 Other Trailer(s) featuring Confidence, The Hard Word, R.S.V.P. Extras Review: Not much here other than a quartet of very similar trailers. The disc itself is cut into 24 chapters, and includes often necessary subtitles, available in English and Spanish. Here's another grim entry in the shoot-em-up London crime genre, one that is improperly compared to being "in the tradition of Lock, Stock and Two Smoking Barrels" right on the front cover. 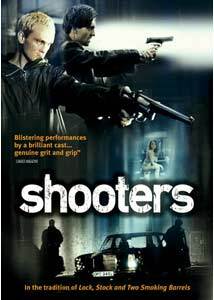 Shooters lacks the black humor of a Guy Ritchie film, but that does not do anything to diminish its entertainment value. This is a dark, violent "last big score" flick, and is blessed with a number of spot-on performances, led by Andrew Howard and Melanie Lynskey as a truly mismatched couple. The print is pretty ugly, but the film itself is certainly recommended as a rental if you're a fan of the genre.